It’s been a competitive jockey colony at Arlington International Racecourse so far this meet due to the addition of a few new faces in the jocks room. One of those is Harry Hernandez, who has enjoyed a solid beginning of the 2018 meet with six victories in 29 mounts. Hernandez, 21, is currently tied for fourth in the standings with Sophie Doyle, who also is riding her first full season at the Chicagoland oval. He has finished in the money at a rate of 48%. “I’m really excited and I’m really focused on my job,” Hernandez said. “Just trying to stay focused on winning races. I thank God and thank my agent [Ben Allen] and the owners for the opportunities that they have been giving me. I’m just trying to show off my experience. Hernandez began his riding career in his native Puerto Rico and attended the Escuela Vocacional Hipica, graduating in the same class as leading riders Jose Ortiz, Irad Ortiz, Jr. and Eric Cancel. 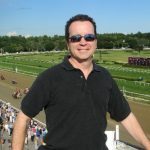 Upon moving to the United States, Hernandez began riding at Finger Lakes in New York where he was consistently finishing in the top of the jockey standings. 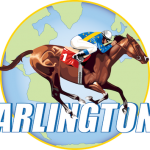 It was good friend and accomplished rider Jose Ortiz, however, that gave him some encouragement to give Arlington a try this summer.